The story of Westoning Baptist Church, like others in the area, begins in the days of John Bunyan. He came to preach at a cottage near Lower Sampshill, in the Parish of Westoning, on 12th November 1660, at the age of 32, and was arrested by the constable and taken to Harlington and then to Bedford, where he was imprisoned for 12 years, just for refusing to stop preaching. In prison, he supported himself and his family by making tagged laces. He also spent time preaching, reading the Bible and writing books, including his well-known book, The Pilgrim’s Progress. 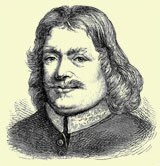 It is said that Bunyan preached from an oak tree near the village which, although now dead, still stands, known as Bunyan’s Oak, between Harlington and Sharpenhoe. The next step in the story is 1672, when four Westoning residents were each fined £20 (a lot of money over 300 years ago) for not going to the Established Church, and instead going to a ‘conventicle’, the term used for a secret meeting of nonconformists or dissenters. The trail then runs cold for over 100 years, until a man named Francis Hews was recorded as being the Pastor of the two Particular Baptist Churches of Dunstable and Westoning. He was 27 when he took up these posts, and there were also, apparently, several murder attempts against him! However, he was Pastor until 1810, when he died, aged 42. During his time, the Church had met in two cottages, but in 1813 the Church bought a larger place at Mead’s Yard, behind the clock tower in the village. That building lasted only 15 years, as it was blown down in a storm on a Sunday evening. Again, they met in houses for a while, but in 1831 acquired land in Greenfield Road for a burial ground, where they decided to build a new Church, which is still standing, and in use today as a church hall. Mr Thomas Chew was the Pastor when the Chapel was built, but died soon after it opened. His brother, Edward, was later chosen as Pastor and he remained so until his death in 1844. There is very little recorded of the early history of this building, although records are complete from 1907 onwards. The 11 original trustees were from nearby parishes and consisted of three yeomen, two bakers, a brewer, a farmer, a shoemaker, a tailor, a blacksmith and a currier. After Edward Chew, there was a break of five years before George Muskett arrived. He was born in Shottesham, Norfolk, and was baptised at Saxlingham. He stayed for 17 years, and these seem to have been good ones for the Church, with 21 being baptised and six joining from elsewhere just in the last six years where records have survived. It was said that he was a ‘faithful, searching and laborious’ preacher. He died in Norwich in 1865, when the Church membership was 68. Two years later, William Darbyshire arrived from Haslingden, in Lancashire, although he did not become Pastor until 1873. Mr Darbyshire transferred his membership from Haslingden, a year after he became Pastor. During his ministry, 34 more members joined. He left Westoning in 1883 after ten years. During his time, there were a lot of changes to the assets of the Church. Firstly, there was felt a need to help the elderly and infirm of Flitwick. A Chapel was built in King’s Road, Flitwick, so that they would not have to walk the mile and a half to Westoning. Although there was never a separate church there, services continued until the end of 1981. The building was sold in 1983 and converted into a house. There were extensions to the graveyard in 1886, and the adjoining field between the Chapel and the railway was bought in 1895 for £70. This turned out to be a very worthwhile investment, as that is where the present Church building stands. 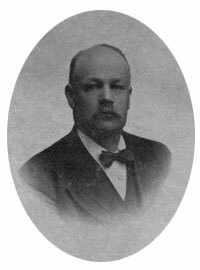 There then began a period of 23 years without a Pastor, until Joseph Field took over in 1907, when there were 38 members. His pastorate was successful, the Church continued to increase, although he saddened the Church by moving on in 1919 to Gornal in the Midlands. Judah Samuel Tingley was next in the pastorate, starting in 1921. This seems to have been a rather unhappy period for both he and they. They asked Mr Field back in 1926, but he refused and censured the Church for their disunity. Mr Tingley continued as Pastor, preaching only intermittently until 1931 when he moved to London. They asked William Haddow of Welwyn to preach in 1937, which he did for a year. They wanted him to continue, but he died in 1939, aged 37. From then on, there was a ‘wilderness’ period of over 40 years without a Pastor, with various itinerant ministers preaching. In 1976, after 45 years, Colin Dawson was invited to take up the pastorate. He accepted, and his ministry commenced in 1978. His ministry was greatly blessed and many people can testify that they have become Christians through his preaching. He baptised around 35 people at Westoning and, while it was not without its difficulties, the Lord used his ministry. 1980s; before this all singing was unaccompanied. The old Chapel building was in a bad state of repair, so in 1983, after much deliberation, approval was granted for the building of a new Church on the old car park next door. This commenced in 1986, and the new Church was opened in October 1989, after being mostly self-built by church members and other regular attenders, who were there most Saturdays for a long time. 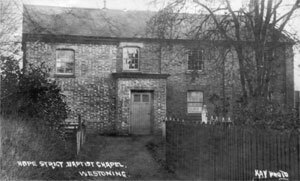 There was also a change of name, from ‘Hope Strict Baptist Chapel’ to simply ‘Westoning Baptist Church’. Through all these changes the church has sought to remain faithful to the Word of God. The Old Chapel is still standing, and still in use, especially by the Toddler Group and for the annual Sale of Work. 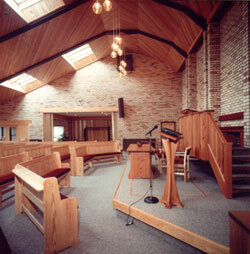 In 2003 a number of members of the Church were sent to begin a new work in Baldock, meeting in the town’s Community Centre. 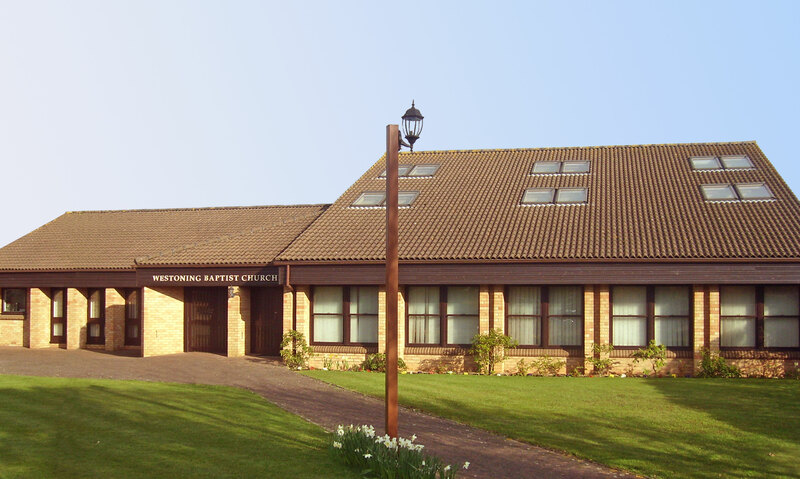 They became an independent Baptist Church in 2006 and their Sunday School and adult work is growing steadily under the pastorate of Mr Jonathan Northern, a former elder at Westoning. In 2008 Mark Riedel became the Pastor, but left us toward the end of 2010 to return to London. Though currently without a Pastor, we continue to serve the Lord and seek His blessing and guidance for the future.